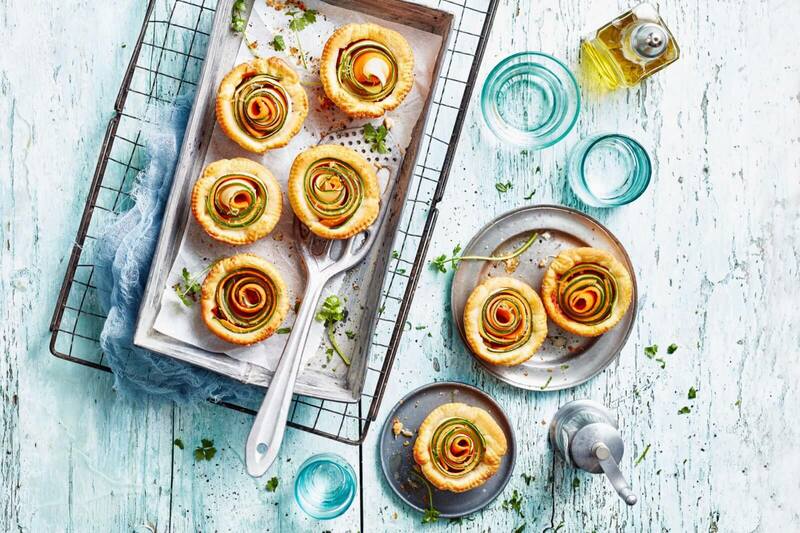 These spiral tarts are good for lunch, a litte snack or as a side with your soup. Doesn’t hurt that they are so beautiful. Lightly cover a muffin mould with some butter or a very small amount of oil. Slice the zucchini and carrot with a cheese slicer (12). Blanch the root glands for 2-3 minutes. Roll out the dough, squeeze the cut lines and cut 6 equal dough parts. Coat the muffin moulds with the dough, create little cups. Divide the red pesto over the bottom of the cups. Put two slices of zucchini and two slices of roasted carrots on top of each other (length wise), roll them up (making the spiral shapes)and place them upright in the pesto. Bake them in the oven for 12-15 minutes.